We stumbled across this article about how batteries work and they had a great visual “Imagine a world where everything that used electricity had to be plugged in. Flashlights, hearing aids, cell phones and other portable devices would be tethered to electrical outlets, rendering them awkward and cumbersome.” We live in a world where batteries are everywhere which means there is an opportunity in rechargeable batteries. Rechargeable batteries, while more expensive up front, can be a money saving investment pretty quickly (not to mention a time saver for those last minute trips to the 24 hour grocery store and getting gouged with the $8.00 premium for 4 alkaline batteries). Rechargeable batteries are best for high drain, frequently used non-emergency devices like kids toys, remotes, wireless keyboards and mice, etc. They are also a great option for portable radios if you are using a lot of alkaline batteries with them. This is a great article on rechargeable batteries and when and where to use them; the different types available and recycling different types of batteries. C. Crane carries a variety of batteries and chargers for portable radios and many other portable electronic devices. 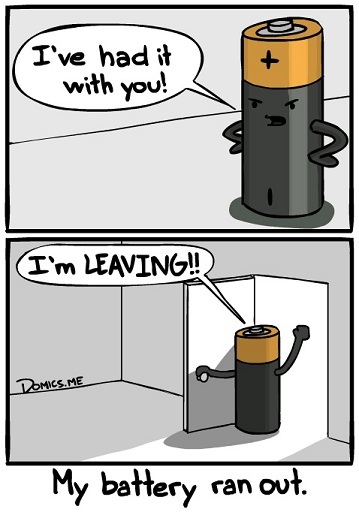 Want to find some mostly clean humor – search the web for battery comics or battery funny. Happy recharging.